In this dark and dangerous Texas small town, Annie Lakes' nightmares come alive when a cold case from her past reveals family secrets that put her life in jeopardy. Mark has seen enough--too much--to assume that Annie's story is a dead end. It turns out that her family is hiding some killer secrets. A long time ago, Annie was just an innocent little girl who saw something she shouldn't. Now she's a target, and Mark's running out of time to protect the woman he's starting to fall for. But how does Mark face off against a murderer who just may be someone Annie loves? 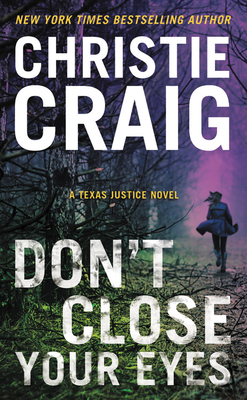 Christie Craig is the New York Times bestselling author of thirty-nine books. She is an Alabama native, a motivational speaker, and a writing teacher, who currently hangs her hat in Texas. When she's not writing romance, she's traveling, sipping wine, or penning bestselling young adult novels as C.C. Hunter. Learn more at CCHunterBooks.com or www.christie-craig.com.